Broom's ability to seize everyone's attention in the crowd at platform 6 secured a photograph that successfully captured the eagerness of those attending the rally. 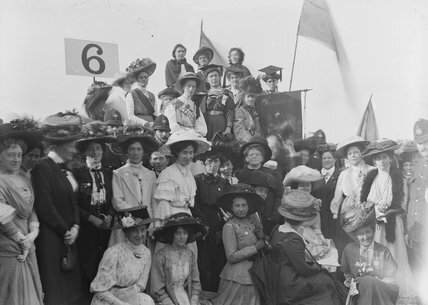 The woman wearing the mortarboard is Irish Suffragette Hanna Sheehy-Skeffington. The officer beside her is wearing a Banner Captain's sash, reflecting the level of organisation that was key to the success of the event that involved 700 banners.